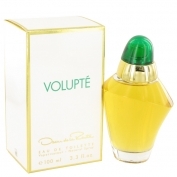 Volupte by Oscar de la Renta is a Floral Green fragrance for women. 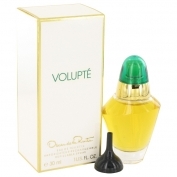 Volupte was launched in 1992. The nose behind this fragrance is Sophia Grojsman. Top notes are mimosa, melon, mandarin orange, freesia, osmanthus, watermelon and cyclamen; middle notes are carnation, jasmine, heliotrope, ylang-ylang, lily-of-the-valley, narcissus, lotus and peony; base notes are sandalwood, amber, patchouli, incense, tuberose and vanilla.